How rare are unflinching acts of self-reflexivity. “Eric had once commented on how closely I listened to him. 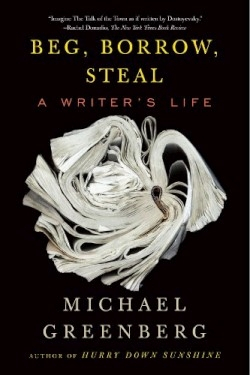 Enough to steal a piece of his soul,” ends one of the essays in Michael Greenberg’s Beg, Borrow, Steal, an autobiography that is an unreserved self-examination. The book is an anthology of stories that first appeared in a Times Literary Supplement column between June 2003 and January 2009, which puts many sides of the writing life on display. The multifacetedness of this book is enabled by its form-a series of essays of between 1,100 and 1,200 words, each focusing on a different topic. Greenberg is a well-known name in the literary community, and with Beg, Borrow, Steal, he offers a worthy successor to his highly acclaimed Hurry Down Sunshine, which was named an Indies Choice Honor Book by the American Booksellers Association and won the Ken Book Award from the National Alliance on Mental Illness. It was also named the “Best Memoir of 2008” by Amazon.com and was among the “Best Books of 2008” chosen by Time and Library Journal. Beg, Borrow, Steal is a writing memoir that belongs in the company of like classics such as Grace Paley’s Just as I Thought, Annie Dillard’s Living by Fiction, William Gass’s Fiction and the Figures of Life, and Eudora Welty’s One Writer’s Beginnings. Because of the necessity of cash, Greenberg’s writing career is a composite of begging, borrowing, stealing; not to mention selling cosmetics from an ironing board in front of a women’s department store, interpreting for Spanish-speaking defendants at Manhattan’s criminal court, and serving at a five-star restaurant. These become as important to writing as actually putting words to paper for pay-collaborating on doomed movie scripts, ghostwriting a memoir, recording an audio version of his book, editing a novel that will never be completed. Each endeavor is for Greenberg an opportunity for research and observation to be translated to page. Greenberg’s writing is not compartmentalized into a separate time and space. He portrays himself taking out a notepad to interview a transgender friend during a social gathering, causing his wife embarrassment. Greenberg’s versatility as a writer-his publication record includes such variety as the New York Review of Books, O, and the Village Voice-is in part owing to his reporting ability. “Occasionally I subjected myself to unneccessary hardship for the sake of research,” Greenberg writes, “such as remaining in a subway car with a strong-smelling homeless woman after everyone else had abandoned it.” This book penetrates the New York that most see-taking readers to the foot on the brake in the subway motorman’s cab. For the essay, “Oh! Oh! There He Goes!,” the author draws on a vast knowledge of rats. The chapter title “Notes of an Anti-Traveler” is surprising given the excursion that is this book. The point made in this chapter is that Greenberg’s travel is not wide in terms of mappable space. Greenberg’s travel remains for the most part bound to the five boroughs, but he goes to discover the “mole people” of underground Manhattan, the gourmet fare at the Broadway Presbyterian Church on 114th, a prerevolutionary African cemetery in the financial district, and the unreachable Hart Island. The writing life is fraught with relational quandaries and emotional ambivalences, and these do not fall outside of the book’s scope. Greenberg deals with thorny identity issues including race, familial roles, and immigration. The first page sounds a “crush of bone as his fist hit the wall,” and this is an apt metaphor for the signature Greenberg story-particularly the Greenberg ending, which is often both witty and tragic, a fusion of insight and pain. Greenberg writes, “My editor’s instructions were simple and concise: each piece had to spill a drop of blood.” They do.